Award-winning Bluecoat American Dry Gin. Photography courtesy Philadelphia Distilling. KAREN HOCHMAN, Editorial Director of THE NIBBLE, prefers her spirits neat. CAPSULE REPORT: The Bluecoats are coming—and thank goodness! We were in need of another great gin, and that it’s an American product makes it all the better. In the process, Philadelphia Distilling, a gifted artisan distiller, has created a new style of gin, American Dry Gin. Bravo! This craft-distilled, super-smooth, complex gin is a beauty, both neat and in mixed drinks. The company has been shipping product since 2006, but as a small brand, no matter how great the reviews, it faces the hurdles of getting distributorship in every state. Philadelphia Distilling also makes the very fine Penn 1681 Rye Vodka and Vieux Carré Absinthe Superieur. So if you know distributors in your state, take action: Get these terrific, reasonably-priced products on the shelf! This is Page 1 of a two-page article. Click on the black links below to visit Page 2. With the holidays approaching, thoughts turn to fine spirits and celebration. But with a bottle of Bluecoat American Dry Gin, every day of the year is a holiday. This artisan gin is distilled in small batches in northeast Philadelphia, in a hand-hammered copper pot still imported from Scotland. If it weren’t for that pesky thing called Prohibition, we’d be a nation of micro-distillers. But thanks to the renaissance in all things gourmet—including alcohol—spirits have finally followed wines and craft brews in the American artisan movement. * Dry Gin is a complex recipe of botanicals—fruits, herbs and spices from all over the world. There are dozens of possible ingredients; each distiller has its own secret recipe. Popular ingredients include angelica root from Germany, cardamom from Sri Lanka, cassia bark from Southeast Asia, coriander seed from the Czech Republic, orris root from Italy and Seville orange peel from Spain. Most of the juniper berries that comprise the base flavor of gin are imported from Italy. See an example of the ingredients in Martin Miller’s Gin. Genever or Jenever. 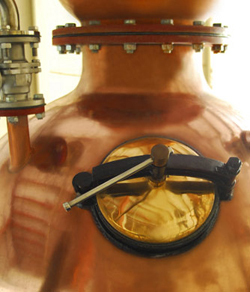 The original gin, it was first made in Holland in a pot still from a grain mash made of barley, rye and corn. There are two styles: Oude (old), which has a golden tint and a sweet, aromatic flavor; and Jonge (young), which is drier and has a lighter body. Overall, it is heavy-bodied and strongly flavored with a pronounced malty taste and aroma. This style is popular in The Netherlands, Belgium and Germany. London Dry Gin. London Dry Gin appeared soon after the continuous still or column still was invented in 1832. The new still made a purer spirit possible, encouraging London distillers to try an unsweetened or dry style (sugars had been used in Genever gins to mask the unpleasant flavors that could appear in pot still production;“dry” means absence of sugar). London Dry Gin was a hit, and became the most common form of gin in the world. It is the style of the big-name gins such as Beefeater, Bombay Sapphire, Gordons, Seagrams and Tanqueray. Originally “London Dry Gin” implied geography; today, Beefeater is the only gin still made in London. Old Tom Gin. More citrusy and not as focused on juniper and other botanicals, Old Tom gin is a style that was popular in 18th-century England but faded away in the 20th century, but may be undergoing a small renaissance. It is slightly sweeter than London Dry gin, but slightly drier than Dutch jenever. The name is said to come from wooden plaques shaped like a black cat (an “Old Tom”) that were mounted on the outside wall of some pubs in 18th century England for passing pedestrians. After they deposited a penny in the cat’s mouth, they would place their lips around a small tube between the cat’s paws. On the other side of the wall, the bartender would pour a shot of gin into the tube. Plymouth Gin. A dry, full-bodied, clear, aromatic and somewhat fruity gin, originally distilled as a local gin in Plymouth, England. Today, it is made by only one company, Coates & Co., in Plymouth, which owns the right to the name. Sloe Gin. Not technically a gin, but a gin-based liqueur flavored with sweet blackthorn plums (sloes). 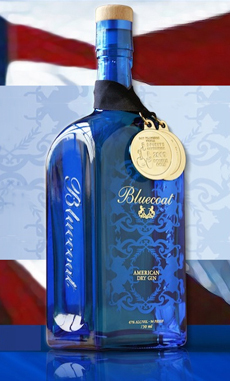 To date, Bluecoat is the only American-produced dry gin, and it has set the bar at the Olympic podium level. Made from certified organic, handpicked botanicals, it is a champion. Everything is made from scratch in a batch distillation process, which makes this gin so much more complex than many other big-names that start with purchasing a neutral spirit and then adding the botanicals. As a result of the artisan process and top ingredients, one can have fun picking out the flavorings from Bluecoat Gin (but more fun savoring each sip, of course). The copper still. Photo courtesy Bluecoat.